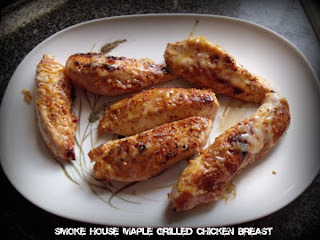 I was so excited to find McCormick's Smoke House Maple Grill Seasoning. It will be nice to be able to mix up some different flavors. Preheat grill to medium heat. Sprinkle chicken with a good coating of the seasoning on both sides. Cook for 10-15 minutes flipping once about half way through, and adding cheese to melt in the last minute or two.